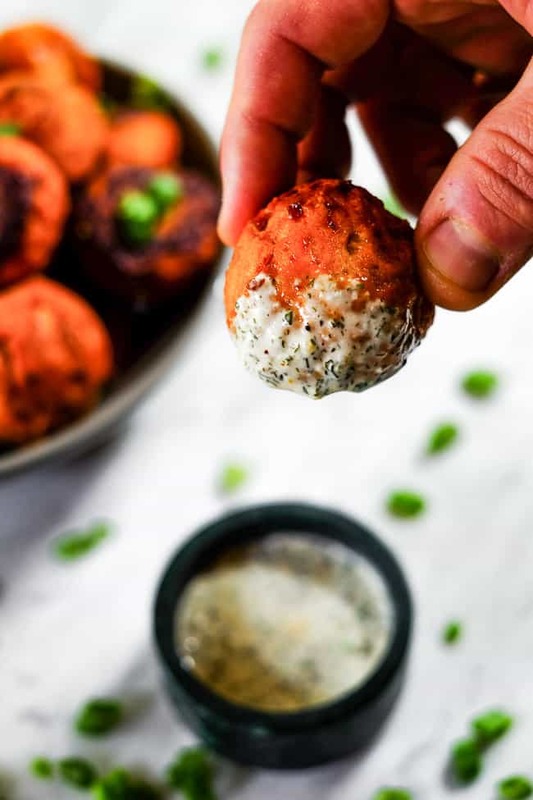 Whether you are meal prepping or looking for an easy weeknight dinner, these buffalo chicken meatballs really need to be on your radar! 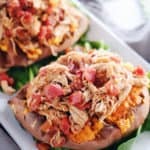 They come together quickly, are ripe with flavor and will have you coming back for more! 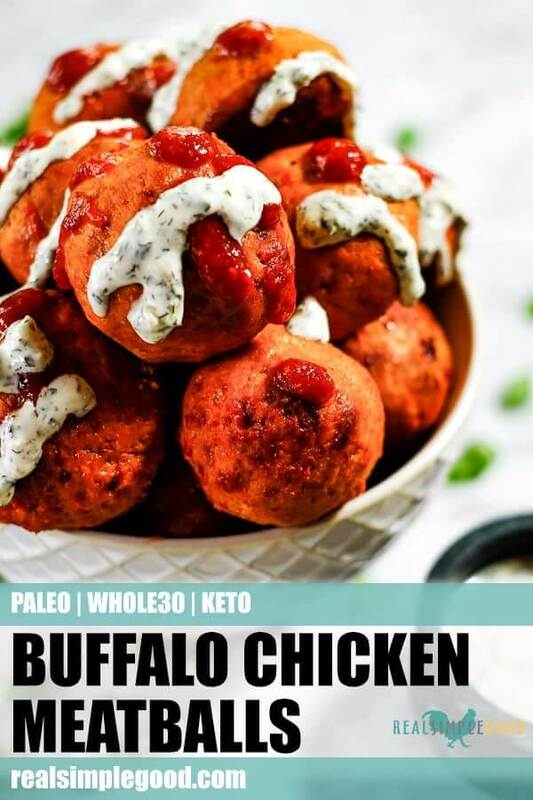 These Paleo, Whole30 + Keto buffalo chicken meatballs are a new favorite around our house! 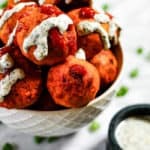 It only takes 30 minutes to make these flavor bomb buffalo chicken meatballs, and you will love the combo of spicy with creamy ranch. You can eat them as they are or throw them on a bed of your favorite greens for a little bowl meal action. That’s what I would do…It’s what I do every time we make these guys. You can really tweak the level of spice in these buffalo chicken meatballs depending on the hot sauce you use. Pick a hot sauce that fits your tolerance and preference for spicy foods. 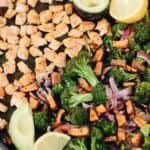 Also, if you are aiming for strict Whole30 or Keto, double check the ingredients to make sure there is no added sugar or other funky ingredients. So…you’ve been warned. 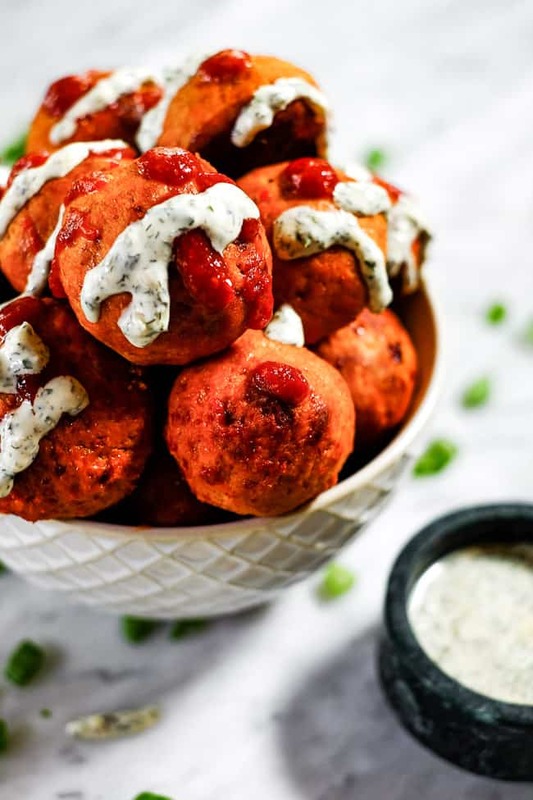 These buffalo chicken meatballs are ADDICTING! 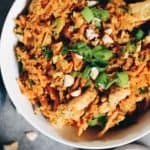 Do yourself a favor and just make a double batch. Your future self will thank you! The first time we made these, we might have eaten all of them in one sitting…ok, it was like in one sitting at the table and then we dipped the rest of them in ranch standing at the counter before we cleaned up the kitchen. So yeah, they’re good! 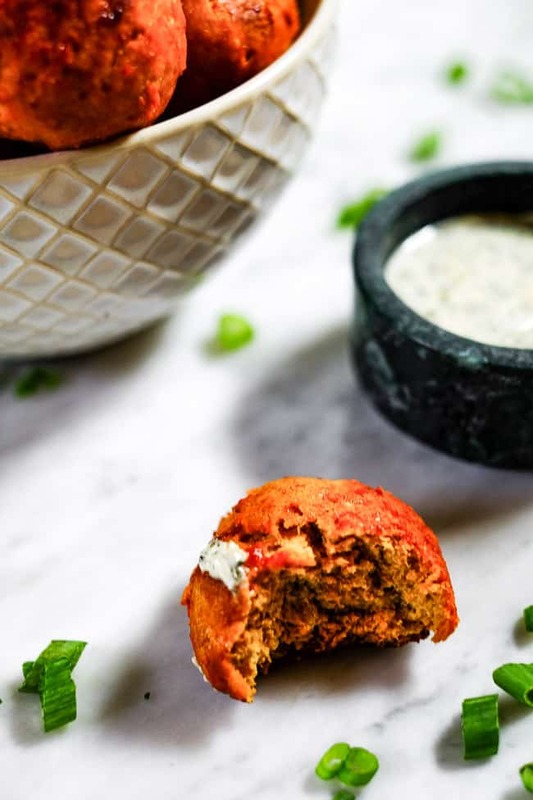 Hurry to your kitchen right now, and make these buffalo chicken meatballs! Leave a comment after you’ve devoured them to let us know how it went. Also, take a pic to share on Instagram. Tag us @realsimplegood, and give us a follow if you don’t already. We’d love to stay connected! 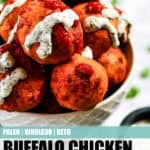 These Paleo, Whole30 + Keto buffalo chicken meatballs with ranch sauce come together quickly, are ripe with flavor and will have you coming back for more! Preheat oven to 400° Fahrenheit and line a sheet pan with parchment paper. 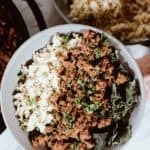 Place the ground chicken, nutritional yeast, hot sauce, mayo and salt in a bowl. Mix ingredients with your hands until incorporated. Form the chicken mixture into small balls about the size of a heaping tablespoon. You can use a small ice cream scoop if you have one, it makes it easy to form the turkey into balls without everything sticking to your hands. This should yield about 12-15 meatballs. 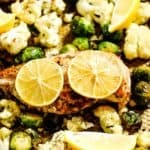 Place in the oven to cook for 20 minutes. To brown them a bit at the end turn your oven to broil and move them up to the top rack to broil for 3-4 minutes. 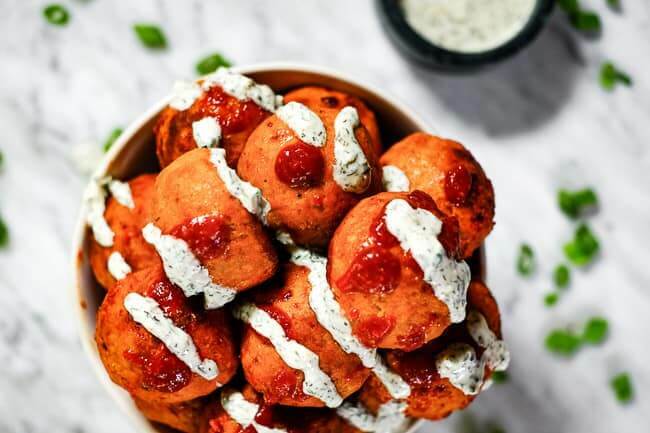 While the meatballs are baking, make the ranch dressing by combining all dressing ingredients in a small bowl or container and whisking well. Refrigerate and whisk again before using. When the meatballs are finished, remove from oven and sprinkle on green onions. Drizzle with ranch dressing for serving or serve the ranch on the side for dipping (optional). Enjoy. Yum! These look great! What is the reason for the mayo in the meatballs?? 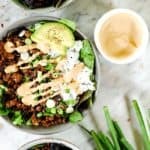 I’m allergic to eggs so wondering if avocado oil would suffice if its there for moisture? It’s there for flavor and to keep the meatballs moist, but you could try subbing avocado oil. Let us know how it goes! Yumtastic! Doubled this for a super bowl party and people are devouring them! No one guessed how healthy they are because the don’t taste like health food! Thank you so much for making my party a hit!